Have a question? Want to know more about the project? Need to speak with a live person? Get in touch with the committee by sending an inquiry using the form, and we promise to get back to you within a timely manner. The Northeast Community Network (NeCN) is an incorporated, regional, not-for-profit organization that promotes collaborative economic development, applied research and support for forestry, mining, agriculture and business development. NeCN provides leadership as we move to align our efforts and resources toward regional development. 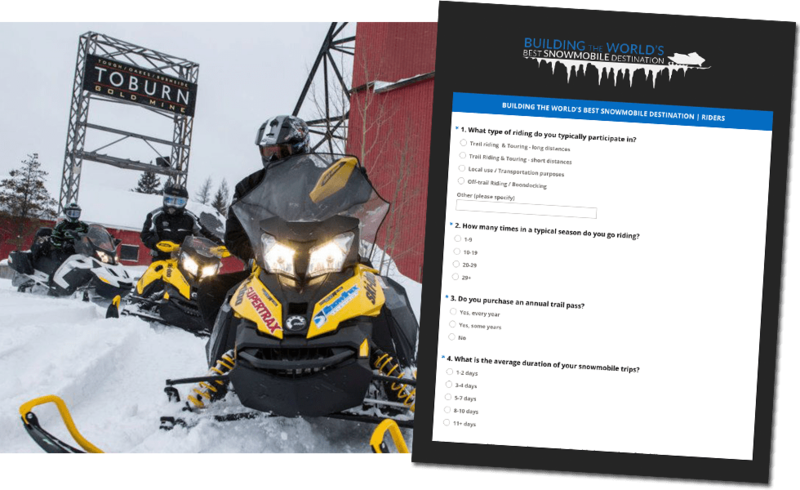 The NeCN, in conjunction with the World’s Best Snowmobile Destination committee, is currently seeking feedback from snowmobilers, clubs, volunteers, tourism operators, local businesses, and community stakeholders, regarding snowmobile tourism within the Northeastern Ontario. Short survey questionnaires have been created to gain feedback from the whole region and its surrounding area. Be engaged. Be Heard. Take the survey today!